I saw a sign yesterday for a local florist advertising $49.99 roses for Valentine's Day-as if that's a steal. Everyone knows florists jack up their prices this time of year, so unless you really need to score some points, there are many more thoughtful, creative and inexpensive gifts that could win her heart (or his). Whether it's for Valentine's Day or any other occasion like a birthday, I like to put together a gift bag or basket of treats. My kids used to give our babysitter Dunkin Donuts gift certificates because she stops there every day for a huge iced latte. If I plan ahead, I order coffee from Montana Coffee Traders, a great find I stumbled upon vacationing in Whitefish, MT (I love their double dipped espresso beans too!). For tea drinkers, I give a tin of Harney & Sons soothing Hot Cinnamon Spice Tea for $6.50, available at gourmet stores or online. 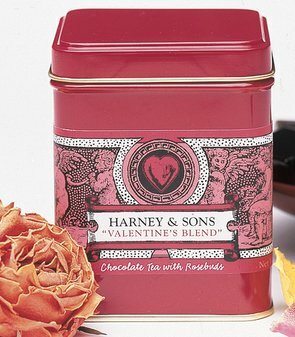 If you can find it, they also make a Valentine's blend for $7 -- chocolate tea with rosebuds! Sur La Table has cute heart-motif mugs (four for $27.50) to pair with coffee or tea. If I have time, I bake something simple or buy sweet treats and add them to the bag. Most years, I buy up a frame and print out a digital photo of my kids to give to my husband. This works great for grandparents too. Another option is a CD of soulful, romantic music like Norah Jones or Diana Krall. Download it on itunes if your valentine has an mp3 player, or better yet, burn your own collection of music tailored to his or her tastes. My son gave me a chocolate flower from Walgreen's yesterday. He paid $2 for it out of his allowance money. My daughter picked out a light-up teddy bear holding a heart. They had so much fun sneaking around and bickering in the store over what mom would like! But the gift that is truly priceless is the heart-shaped pillow my son gave me inscribed with the word, "Hottie." I know better than to ask whether that one was heartfelt!